Third Avenue from Ferry looking east: The crown of the street will be flattened in the reconstruction. Albany’s urban renewal board had three options for repaving seven blocks of two downtown streets. It chose the one that would take longer and cost more than the others because it should result in stronger pavement and less maintenance through the years. The full reconstruction covers four blocks of Second Avenue, from Washington to Lyon Street, and three on Third, from Ferry to Lyon. It is scheduled as soon as the weather allows. 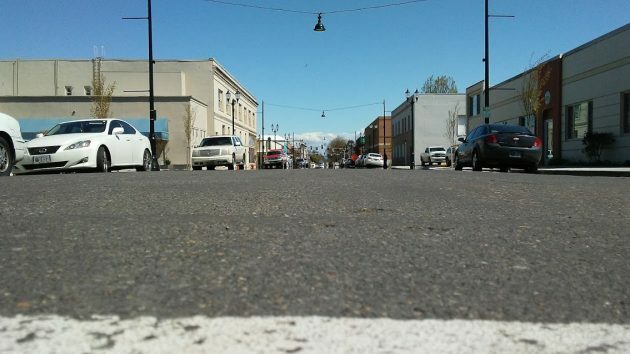 On Wednesday, the advisory board of the Central Albany Revitalization Area was given three options for fixing those streets, among the last elements of the city’s downtown streetscape enhancement program. The board unanimously chose Option 3, which will add $444,000 to the cost of the original streetscape contract of $7,637,700, according to City Engineer Staci Belcastro and Lori Schumacher, also an engineer in public works. This option calls for excavating the streets and rebuilding them with seven inches of asphalt over 12 inches of rock, the current city standard for major streets, resulting in a pavement life of more than 20 years. The work also will eliminate the steep crowns in those blocks. The engineers estimate it will take 40 working days to accomplish this. The other options were to do a less complete reconstruction. The cheapest, at no additional cost, would grind down three inches of the pavement and replace it with a layer of asphalt. But the engineers said cracks and trench cuts in the underlying pavement would likely reappear in as little as five years. The second option, at an additional cost of $229,000, was to do a reconstruction with less rock and a thinner layer of asphalt than Option 3. Councilman Rich Kellum was concerned about the harm the additional disruption of having the streets torn up would do to businesses downtown. Am I the only one that thinks it is a strange coincidence that a .05 cent per gallon gas tax is on the May ballot right after most of the downtown streets have been torn up for ages? All the money that went into downtown lighting, sidewalk trees, sidewalk modifications, etc., etc., etc. would have gone a long way toward repairing the streets all around town. The major roads through Albany are the responsibility of ODOT. Do the City Council and CARA think that spending all this beautification money ($8 million) is going to make downtown Albany a Mecca for businesses? Right now the businesses consist of boutique shops and a few restaurants with limited operating hours. It’s time to face reality, as urban sprawl results in people living further from the city center, the shopping locations of choice move away from the city center. Seems that the city council and CARA have some very strange ideas about how to spend the taxpayers money for the COMMON good. Please note my emphasis on common. What year is this? 1984?